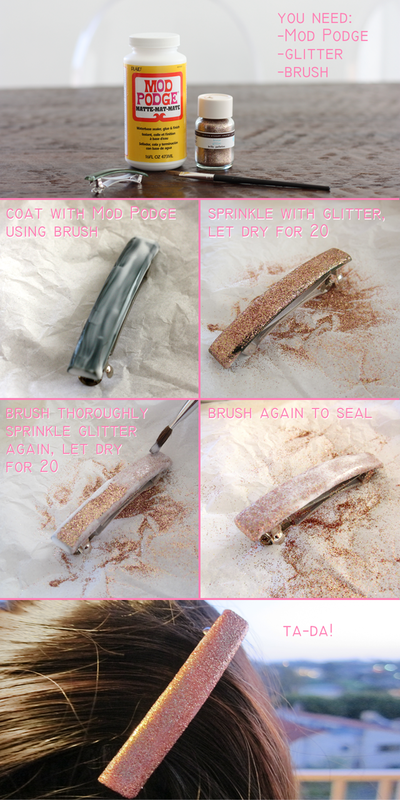 3 Minute Glitter Hair Clip! I was recently pulling an outfit to wear to an event when I realized that there was something missing… a bit of sparkle in my hair. I didn’t have time to go out and buy anything and didn’t have a hair accessory with that certain je ne sais quoi, so I decided to quickly make it with items I had on-hand! This little project requires about an hour total, with less than 3 minutes of actual “work,” so even the most casual DIYer can complete it with ease! Let me know if you try this (I used one of my favorite Goody no-slip clips). And may I suggest that you always keep Mod Podge and a variety of glitters on hand? It is so easy to quickly cutesy up anything.. Mark better watch out before the whole house is sparkling! Are you selling these? Please let me know!